The purpose of this research is to show that the correlation analysis on surface electromyographic (sEMG) signals that originally confirmed existence of a standing wave central pattern generator (CPG) along the spine are reproducible despite evolution of the entrainment technique, different hardware and data collection protocol. Moreover, as major novelty of the present research, it is shown that this CPG can undergo “bifurcations,” here revealed by signal processing extrapolated towards the period-halving dynamical interpretation. The visually intuitive manifestation of the bifurcation is statistically confirmed—using bootstrap analysis—by a shift in the cross power spectral densities, consistently with the standing wave occurring on different subbands of the Daubechies DB3 wavelet decomposition of the sEMG signals. Objective: To present the clinical outcomes of Network Spinal Analysis (NSA) chiropractic care and Somato Respiratory Integration (SRI) exercises in an adult female suffering from anxiety, panic attacks, and comorbid somatic complaints. Clinical Features: A 49-year-old woman presented to a wellness based chiropractic clinic suffering from anxiety and panic attacks with associated chest pains for a period of eight months with no improvement. The presenting complaints began following a three-year period of prolonged stress. The patient’s history revealed past episodes of extreme stress and trauma. Interventions and Outcomes: A program of Network Spinal Analysis chiropractic care was employed to improve Spinal and Neural Integrity (SNI), including the reduction of Adverse Mechanical Cord Tension (AMCT) and vertebral subluxations. Somato Respiratory Integration exercises were utilized to enhance somatic awareness and provide greater internal safety. AMCT was assessed and measured using a Heel Tension Scale. Quality of life improvements were measured using a self-rated Health, Wellness, and Quality of Life (HWQL) survey. A steady reduction of anxiety and panic attacks was achieved during the first six weeks of care with significant quality of life improvements. Resolution of a panic disorder was achieved within fourteen weeks of care. Conclusion: Network Spinal Analysis and Somato Respiratory Integration care was associated with the resolution of a panic disorder with significant quality of life improvements in this case. Further research is recommended to explore the role of chiropractic care combined with Somato Respiratory Integration exercises for the management of anxiety disorders and/or other stress related conditions that may be mediated through the spine. The Network Spinal Wave as a Central Pattern Generator Senzon S, Epstein D, Lemberger D. The Journal of Alternative and Complementary Medicine. July 2016, 22(7): 544-556. doi:10.1089/acm.2016.0025. Objectives: This article explains the research on a unique spinal wave visibly observed in association with network spinal analysis care. Since 1997, the network wave has been studied using surface electromyography (sEMG), characterized mathematically, and determined to be a unique and repeatable phenomenon. Methods: The authors provide a narrative review of the research and a context for the network wave's development. Results: The sEMG research demonstrates that the movement of the musculature of the spine during the wave phenomenon is electromagnetic and mechanical. The changes running along the spine were characterized mathematically at three distinct levels of care. Additionally, the wave has the mathematical properties of a central pattern generator (CPG). Conclusions: The network wave may be the first CPG discovered in the spine unrelated to locomotion. The mathematical characterization of the signal also demonstrates coherence at a distance between the sacral to cervical spine. According to mathematical engineers, based on studies conducted a decade apart, the wave itself is a robust phenomenon and the detection methods for this coherence may represent a new measure for central nervous system health. This phenomenon has implications for recovery from spinal cord injury and for reorganizational healing development. Objective: The objective of this study is to report on the reorganization of the cervical curve in a patient undergoing Network Spinal Analysis chiropractic care. Clinical Features: The patient is a 31-year-old male who presented for Network care with complaints of arthritis in his neck, stabbing pain in ribs and numbness/tingling in both hands. Radiographs were taken which demonstrated an Atlas Plane Angle measurement of 14.7° indicating loss of cervical lordosis. Intervention and Outcomes: Chiropractic care plan consisted of Network Spinal Analysis care. Based on initial spinal assessment, low force spinal adjustment contacts were applied to enhance spinal and neural integrity and increase somatic awareness. The patient received a total of 61 adjustments over a period of 6 months. After 6 months surface electromyography, thermal scan, radiology and patient’s subjective assessment demonstrated significant improvement. Lateral cervical film showed increase in Atlas Plane Angle to 30° and the restoration of the patient’s lordotic cervical curve. Conclusion: This case study reports on the increase of the cervical lordosis in a patient undergoing Network Spinal Analysis care. Improvement in the patient’s objective outcomes indicates that while under Network care, the patient’s body has undergone reorganization. This case study adds to subluxation-based chiropractic research focused on the restoration of the cervical curve. Further research is warranted to determine the relationship between Network Spinal Analysis adjustments and improvement in the cervical curvature. Objective: To report on the improvements in a child with difficulties in concentration, learning, and abdominal migraines while receiving Network Spinal Analysis (NSA) chiropractic care. Clinical Features: A 6-year-old girl presented with difficulties in concentration and learning since beginning school more than twelve months earlier. She also suffered from severe stomach pain for over two months diagnosed as abdominal migraines. She received NSA care over a period of six weeks. Spinal and neural integrity (SNI) was assessed and measured weekly through palpation, visual postural analysis, and heel tension scales. Results: Improvements were seen in concentration and learning along with a complete resolution of abdominal migraines. These improvements were consistent with greater SNI (including the reduction of adverse mechanical cord tension (AMCT) and vertebral subluxation) achieved through NSA care. Conclusion: The results documented in this case suggest comorbidity between difficulties in concentration, learning, and abdominal migraines. NSA chiropractic care was found to be of clinical benefit in this case by improving SNI. Further research is needed to investigate the relationships between SNI and co-occurring stress related conditions. 12th International Research and Philosophy Symposium (IRAPS) Sherman College of Chiropractic Spartanburg, SC October 10-11, 2015 Various Authors. Annals of Vertebral Subluxation Research. November 27, 2015. pp 184-212. Objectives: To report on and discuss the changes in a 72 year old male who presented for chiropractic care suffering from multiple health complaints. Case History: A 72 year old male presented to a private chiropractic practice in Auckland, New Zealand suffering from severe postural alterations, mild depression, low back pain, balance disturbances, perpetual tiredness and mild depression. Interventions and Outcomes: Over a nine week period, a specific and conservative chiropractic care plan was provided to the patient. The care plan involved Network Spinal Analysis (NSA) adjustments and the frequency of care was altered throughout this period based on both subjective and objective measures. A complete health history and physical examination was completed prior to care. A full posture analysis (Posture Pro 8 posture analysis system), and surface electromyography (sEMG) scans were performed at baseline and were then monitored regularly over the nine week period. Subjective measures were also monitored during each adjustment visit. Significant improvements were noted in postural and sEMG findings as well as in subjective measures of health over the 9 week period. Conclusions: While under chiropractic care, improvements in both self-reported subjective and objective measures were noted in a patient with severe postural alterations, low back pain, balance disturbances, perpetual tiredness and a mildly depressive state of mind. These improvements include overall physical, mental, and emotional well-being of the patient. Introduction: A 36 year-old female presented to a wellness based chiropractic clinic suffering from uncontrollable hyperkinesia, featuring myoclonic jerks and tics. A neurologist made the diagnosis of a functional (nonorganic) movement disorder and referred the patient to a psychiatrist for treatment of a suspected psychogenic movement disorder. She chose not to see a psychiatrist and instead began chiropractic care. Methods: Network Spinal Analysis (NSA) and Somato Respiratory Integration (SRI) care was delivered over a period of twenty weeks. The patient was evaluated for indicators of Adverse Mechanical Cord Tension (AMCT), including vertebral subluxation and spinal defense patterns, according to the NSA protocol. Spinal and neural integrity (SNI) was assessed through static and motion palpation, postural and neurological assessments, and surface electromyography. Results: Significant improvements in SNI were achieved, as were other wellness based outcomes of NSA and SRI care as reported by the patient. These improvements coincided with the steady improvement of all signs and symptoms of a FMD, with a complete resolution of all hyperkinetic movement, myoclonic jerks, and tics by 20 weeks of care. Conclusion: NSA and SRI care was found to be of promise for restoring neurological function in a patient with a FMD. The findings in this case could support further research into the relationships between SNI, vertebral subluxation, and FMD’s. The Seasons of Wellbeing as an Evolutionary Map for Transpersonal Medicine Epstein D, Senzon S, Lemberger D. International Journal of Transpersonal Studies, 33(1), 2014, pp. 102130. The four Seasons of Wellbeing (Discover, Transform, Awaken, and Integrate) refer to distinct rhythms, periods, and factors that influence the accessibility of an individual’s resources during the journey of life. Each season is explicitly and implicitly related to an individual’s experience, focus, and capacity for selforganizational states. Each can be used to understand, organize, and foster behavior change, positive growth, transformation, and human development. A genealogy of the seasons is described, emphasizing the empirical and theoretical foundations of Reorganizational Healing and its roots in models such as Grof ’s Systems of Condensed Experiences (or COEX Systems) and Wilber’s Integral Theory and Pre/Trans Fallacy. In the context of transpersonal medicine, the seasons offer a framework through which various levels and states associated with an individual’s growth can be mapped and utilized for personal evolution. In this context, seasons are applicable for practitioners and clients who have used transpersonal states to avoid painful emotions or difficult actions. The seasons can guide transpersonal medical clients on a path towards transpersonal being and integration of various states leading to a higher organizational baseline. As a practical tool, the seasons have pertinence in the development of “transpersonal vigilance,” a term defined in this article. The seasons offer resources to practitioners to support clients toward transpersonal being, in a reorganizationally informed or reorganizational way. Objective: To describe the care of two children diagnosed with Autism Spectrum Disorder and the documented changes in their language skills while receiving Network Spinal Analysis (NSA) chiropractic care. Clinical Features: Two children, under the age of 4 diagnosed with autism spectrum disorder, received NSA care for one year. The specific outcome that was measured was the Preschool Language Scale-4 (PLS-4). The PLS-4 was given four times over a one year period. Results: Expressive and receptive language delays were assessed before, during, and after NSA care. These children saw an average increase of 24 months of language development in one year, while under NSA care. Conclusions: The progress documented in this report suggests that NSA care may have positively affected the language development of these children. We support further research in this field. Objective: To report on multisystem health changes of a patient diagnosed with Meniere’s disease while under a long term chiropractic care program utilizing Network Spinal Analysis (NSA). Clinical Features: A 56 year old white male presented to a chiropractic clinic with a complaint of bilateral carpal tunnel symptoms, numbness in both feet after sitting, and pain and fullness in the left ear. The left ear pain and fullness was also accompanied by dizziness and progressive hearing loss experienced over the past twenty years. Physical examination revealed significant structural and neurological imbalances. Spinal subluxations were identified at multiple levels of the spine. The patient had been managing his symptoms with ten different medications prescribed for various complaints including: blood pressure, anxiety, muscle spasms and fluid retention. Auditory evaluations had shown progressive degeneration of hearing in his left ear, along the whole range of frequencies tested. Intervention and Outcomes: The patient received NSA care, basic workshop style education about stress, simple range of motion exercises, and beginning Somato-Respiratory Integration exercises. The first reevaluation showed positive changes in symptomatology and lifestyle. His auditory exam four months from the start of care showed improvements especially with lower frequencies. These changes in hearing continued to improve, and then were maintained over the course of treatment. Conclusions: In this case, an individual diagnosed with Meniere’s disease had improved hearing as well as reduction of other symptoms while enrolled in an NSA care program. degrees to 22 degrees. The patient’s subjective findings reflect these changes. Conclusions: Network Spinal Analysis™ care, and other low force techniques, may be effective in reorganizational change by addressing structural deformities in the spine and in restoring normal spinal curves. More research is needed in this area. Objective: To describe the reorganization and reduction of intraocular pressure (IOP) in a chiropractic patient with diabetic retinopathy and concurrent loss of vision undergoing Network Spinal Analysis (NSA) care. Clinical Features: A 46-year-old male with type I insulin dependent diabetes presented for chiropractic care. His complaints included numbness in both arms and fingers of the left hand, and diabetic retinopathy with total loss of vision for the past five years. Intervention and Outcomes: The patient received NSA care 221 times over three years. After 8 months of care, he reported seeing shapes and colors through his left eye only for the first time in 5 years. He also reported a drop in intraocular pressure from an initial 50 mm Hg down to 18 mm Hg. Conclusion: The patient in this case experienced improved intraocular pressure and vision following Network Spinal Analysis care. More research is warranted to better understand this link between Network Spinal Analysis care, chiropractic and the diabetic patient. Reorganizational Healing as an Integrally Informed Framework for Integral Medicine Senzon S, Epstein D, Lemberger D. Journal of Integral Theory and Practice, 2011 6(4), 113-133. Reorganizational Healing (ROH) is explored as an integrally informed methodological framework to be utilized within the emerging field of Integral Medicine. ROH assists individuals to discover who they are in their current situation, symptom, life challenge, or life evolution. Transformation and awakening are accessed in ROH in terms of the individual’s readiness to change as well as various energetic typologies of change and resource availability (biological, emotional, mental, and spiritual). Developing an ROH map assists both healer and patient in understanding how they change; what energetic intelligences are available as resources; and what “season” one is in, in terms of discovery, transformation, awakening, or integration. The history of ROH, which has developed over the past 30 years, is also recounted. Objective: To describe the restoration of a cervical curve following Network Spinal Analysis™ (NSA) chiropractic care in a patient with neck pain. Clinical Features: The patient presented with a chief complaint of neck pain. Radiographs were taken and demonstrated an Atlas Plane Angle measurement of 12° and a cervical Absolute Rotation Angle (ARA) of 10°, representing a cervical kyphosis. Intervention and Outcomes: The patient received NSA care that consisted of Network adjustments entailing light contact to specific regions of the patient’s spine. Follow up radiographs were taken after one year of care. The radiographs demonstrated significant sagittal curve improvement with an Atlas plane line measurement of 32° and an Absolute Rotational Angle (ARA) of -27°. Conclusion: Successful chiropractic care was described in this case by improved measurements in the cervical curve. The Atlas plane line improved by 18° and the Absolute Rotation Angle improved by 37°. More research is warranted in this area. An electrophysiological phenomenon running up and down the spine, elicited by light pressure contact at very precise points and thereafter taking the external appearance of an undulatory motion of the spine, is analyzed from its standing wave, coherence, and synchronization-at-a-distance properties. This standing spinal wave can be elicited in both normal and quadriplegic subjects, which demonstrates that the neuronal circuitry is embedded in the spine. The latter, along with the inherent rhythmicity of the motion, its wave properties, and the absence of external sensory input once the phenomenon is elicited reveal a Central Pattern Generator (CPG). The major investigative tool is surface electromyographic (sEMG) wavelet signal analysis at various points along the paraspinal muscles. Statistical correlation among the various points is used to establish the standing wave phenomenon on a specific subband of the Daubechies wavelet decomposition of the sEMG signals. More precisely, ∼10 Hz coherent bursts reveal synchronization between sensory-motor loops at a distance larger, and a frequency slower, than those already reported. As a potential therapeutic application, it is shown that partial recovery from spinal cord injury can be assessed by the correlation between the sEMG signals on both sides of the injury. needed to examine the short and long-term impact of subluxation-based care for those children with cystic fibrosis. Reorganizational Healing, (ROH), is an emerging wellness, growth and behavioral change paradigm. Through its three central elements (the Four Seasons of Wellbeing, the Triad of Change, and the Five Energetic Intelligences) Reorganizational Healing takes an approach to help create a map for individuals to self-assess and draw on strengths to create sustainable change. Reorganizational Healing gives individuals concrete tools to explore and use the meanings of their symptoms, problems, and life-stressors as catalysts to taking new and sustained action to create a more fulfilling and resilient life. Objective: Anecdotal preliminary evidence suggests that chiropractic care may be of benefits for individuals suffering from ADHD. This case series presents the improvement in attention experienced by 9 adult patients undergoing Network Spinal Analysis. Methods: Nine adult patients are presented (4 male, 5 female) with a mean age of 40.4 years (range 22 – 58 years old). All patients were evaluated with the Test of Variable of Attention (TOVA) before receiving Network Spinal Analysis (NSA) care and at 2 months into care. The nine patients received level 1 NSA care for two months, as taught by the Association for Network Care. Neurospinal integrity was evaluated with palpation, as well as surface electromyography. Cognitive process of attention was objectively evaluated using a continuous performance test, the Test of Variables of Attention (TOVA). Conclusion: In this case series the nine adult patients experienced significant improvement in attention, as measured by objective outcomes, after receiving two months of Network Spinal Analysis. The progress documented in this report suggests that NSA care may positively affect the brain by creating plastic changes in the prefrontal cortex and other cortical and subcortical areas serving as neural substrate for the cognitive process of attention. These findings may be of importance for individuals suffering from attention deficit. Further research into this area is greatly needed. Purpose of Study: This case study is to report the improvement in quality of life experienced by a patient undergoing subluxation-centered chiropractic care. Clinical Features: A 36 year old male presented with primary health concerns of stress, eye pain and left leg pain of 14 years duration radiating to the foot and secondary complaints of gastritis, ulcers, nervousness, depression, lack of concentration and general loss of interest in daily life. The patient also smokes, does not exercise, eats a sub-optimal diet and rated his family and friends support, as well as job satisfaction as sufficient. Intervention and Outcome: We discuss the various analyses employed to evaluate vertebral subluxations, including paraspinal surface electromyography and thermography. Adjustive care included a combination of Network Spinal Analysis, Torque Release Technique and diversified structural adjustments to correct vertebral subluxations over a six month period. We used visual analog scales, open-ended questions and selected items from the Self-Rated Health and Wellness Instrument to monitor health changes, as well as the positive improvements in quality of life as perceived by the patient himself. Conclusion: This case study demonstrates that the correction of vertebral subluxations over an 11 month period was associated with significant improvements in the quality of life of the patient. Objective: This case study documents the chiropractic care of battered woman struggling with Intimate Partner Violence (IPV). Chiropractic offers battered women a unique service, it is the only profession trained and licensed to detect and correct vertebral subluxations. The relationship between the stresses of abuse and vertebral subluxation, as well as the subsequent changes during chiropractic care, are described. Clinical Features: A Caucasian, 23-year old female presented with headaches, neck pain, and upper back pain. The initial complaint noted sharp, knife-like pains into the medial scapular borders, worse on the right side. Tingling extended into the right hand, most severe in the 2nd, 3rd, and 4th fingers. Chiropractic care and outcome: Protocols of both Torque Release and Activator techniques were utilized to evaluate vertebral subluxations. Subjective quality of life issues were evaluated through a Network Spinal Analysis (NSA) Health Status Questionnaire. After commencing chiropractic care, this woman suffered a cervical spine hyper-extension/hyper-flexion type injury from an automobile accident. For the first 30 days after, adjustments were applied twice weekly. Acute exacerbations of symptoms unrelated to the original complaints were displayed and progress became irregular. During the next 60 days, there were various unexplained falls and severe flare-ups of painful symptoms, and she finally admitted to being battered by her husband. Referrals to counselors and programs dealing with domestic violence were provided. Once the physical battering stopped, consistent progress was noted in both clinical symptoms and quality of life issues. Conclusion: As a battered woman must receive emotional and social support to improve her situation, it is important for chiropractors to recognize the “red flags” of IPV. Chiropractors re-evaluate regularly for changes in vertebral subluxation patterns and can recognize inconsistent responses. They may also be the first caregivers to offer a vitalistic approach; considering a woman’s physical, chemical, and emotional quality of life; a perspective that offers significant connection and trust. This article serves as a foundation on the topic of IPV and chiropractic, for use in both communities. OBJECTIVE: Empirical application of a theoretical framework linking use of Network Spinal Analysis (NSA; a holistic, wellness-oriented form of complementary and alternative medicine [CAM]), health lifestyle practices, and self-reported health and wellness. DESIGN: Cross-sectional self-administered survey study. RESPONDENTS: Two thousand five hundred and ninety-six (2596) patients from 156 offices of doctors who were members of the Association for Network Chiropractic (currently titled Association for Network Care); estimated response rate was 69%. MEASURES: Exogenous variables entered into the structural equation model include gender, age, education, income, marital status, ailments, life change, and trauma. A wellness construct consisted of calculated difference scores between two referents, "presently" and "before Network" care, for self-reported items representing wellness domains of physical state, mental-emotional state, stress evaluation, and life enjoyment. Positive reported change in nine items assembled into dietary practices, health practices, and health risk dimensions serve as indicators of the construct of changes in health lifestyle practices. The NSA care construct consisted of duration of care in months, awareness of energy and awareness of breathing since beginning Network care. RESULTS: Of the exogenous variables only gender, age, and education remain in the final parsimonious structural equation model in these data. Reported wellness benefits accrue to individuals along a direct path from both self-reported positive lifestyle change (0.22), and from NSA care (0.43). The path (0.65) from NSA care to positive health lifestyle changes indicates that NSA care also has an indirect effect on wellness through changes in health lifestyle practices. CONCLUSIONS: The Structural Equation model tested in these analyses lends support to our theoretical framework linking wellness, health lifestyles, and CAM. This study provides further evidence that our measurements of health and wellness are particularly appropriate for investigating wellness-oriented CAM. There is a positive relationship between the experience of NSA care and self-reported improvements in wellness as well as self-reported changes in lifestyle practices. NSA care users tend toward the practice of a positive health lifestyle, which also has a direct effect on reported improvements in wellness. These empirical links are discussed relative to the sociodemographic characteristics of this population and show that use of NSA care is an aspect of a wellness lifestyle. framework for CAM research based on the interrelationship of CAM with health promotion, wellness, and health lifestyles. To date, few studies have sought to bring these various elements together into a single, comprehensive model that would enable an assessment of the complexity of individual health and wellness in the context of CAM. We argue that attention to literatures on health measurement and health lifestyles are essential for exploring the effectiveness and continuing use of CAM. Network Spinal Analysis TM (NSA) care has been transitioned from a health care system with the objective of correction of two types of vertebral subluxation, to a multi-component system of health care delivery with emphasis on wellness education for participating clients. NSA care is now delivered and communicated in discrete Levels of Care with emphasis on client participation through self-evaluation. Emphasis on wellness education will be introduced into NSA practice through training via a Certificate Program currently under development. This paper considers some hallmarks that delineate a wellness education, patient (client)centered practice. The concepts presented relative to this wellness model of health care delivery are believed to be applicable to any approach with similar practice objectives. The perspective presented considers that the major aspects of a patient-centered, wellness education health care delivery system is multi-dimensional. Hallmarks include differentiating terms, and establishing a wellness mentality. Substantiation of the discipline must be established through credible published research regarding its efficacy and safety as well as a consistent and valid means of measuring progressive outcomes derived from the care received. The relationship of NSA to other disciplines is discussed. Objective: This case report describes the successful in vitro fertilization (IVF) of a 34 year old female who had one previous aborted IVF attempt prior to Network Spinal Analysis (NSA) care. This case report is being presented to add to other case reports that show positive physiological changes in patients receiving NSA care. Clinical Features: The IVF was attempted due to her partner’s azoospermia. The first IVF attempt was on 3/26/02. The patient had a poor follicular growth after the standard hyper-stimulation process of the ovaries, including pre-treatment with Mircette (birth control pills) and 1mg/0.2ml of Lupron (a gonadotropin releasing hormone agonist), and 3-6 amps of Gonal-F (a recombinant fsh) starting on cycle day 3. Her baseline day 3 estradiol and LH levels were only 21.2pg/me and 5.0 I.U./L respectively. On cycle day 8, estradiol was only 56% and LH was 6.6 I.U./L. The Gonal-F was increased to 6amps. This first attempt was canceled due to the poor follicle growth. Only 3-4 follicles of insufficient size between 10-14mm each were found. Chiropractic Care and Outcomes: On 4/11/02, the patient commenced regular NSA care. The second IVF attempt began on 6/6/02. The change in IVF protocol was the addition of Repronex (also a gonadotropin a combination of LH and fsh). The total increased dose of Gonal-F and Repronex was 6amps, compared to the first attempt of only 3amps which was then increased to 6amps of Gonal-F only. Conclusion: On the second IVF attempt, estradiol was 1001pg/ml on day 8, and 2019pg/ml on day 11, with LH at 9.3. The Oocyte retrieval after the second attempt was 10 eggs, each approximately 18mm. A successful aspiration of eggs was completed on 6/17/02, and a successful pregnancy followed. The patient is still under NSA care, and is now in her second trimester with normal fetal heart sounds. The possible role of NSA care in the vigorous follicular growth and other health benefits is discussed. Objective: Infertility is distinct from sterility, implying potential, and therefore raises questions as to what insult or interference influences this sluggish outcome. Interference in physiological function, as viewed by the application of chiropractic principles, suggests a neurological etiology and is approached through the mechanism of detection of vertebral subluxation and subsequent appropriate and specific adjustments to promote potential and function. Parental health and wellness prior to conception influences reproductive success and sustainability, begging efficient, effective consideration and interpretation of overall state and any distortion. A discussion of diverse articles is presented, describing the response to chiropractic care among subluxated infertile women. Clinical Features: Fourteen retrospective articles are referenced, their diversity includes: all 15 subjects are female, ages 22-65; prior pregnancy history revealed 11 none, 2 successful unassisted, 1 assisted, 1 history of miscarriage. 9 had previous treatment for infertility, 4 were undergoing infertility treatment when starting chiropractic care. Presenting concerns included: severe low back pain, neck pain, colitis, diabetes, and female dysfunction such as absent or irregular menstrual cycle, blocked fallopian tubes, endometriosis, infertility, perimenopause and the fertility window within a religiousbased lifestyle, and a poor responder undergoing multiple cycles of IVF. Chiropractic Care and Outcome: Outcomes of chiropractic care include but are not limited to benefits regarding neuromuscular concerns, as both historical and modern research describe associations with possible increased physiological functions, in this instance reproductive function. Chiropractic care and outcome are discussed, based on protocols of a variety of arts, including Applied Kinesiology (A.K. ), Diversified, Directional Non-Force Technique (D.N.F.T. ), Gonstead, Network Spinal Analysis (N.S.A. ), Torque Release Technique (T.R.T. ), Sacro Occipital Technique (S.O.T.) and Stucky-Thompson Terminal Point Technique. Care is described over a time frame of 1 to 20 months. Conclusion: The application of chiropractic care and subsequent successful outcomes on reproductive integrity, regardless of factors including age, history and medical intervention, are described through a diversity of chiropractic arts. Future studies that may evaluate more formally and on a larger scale, the effectiveness, safety and cost benefits of chiropractic care on both well-being and physiological function are suggested, as well as pursuit of appropriate funding. 30% better than linear predictors.This suggests that the waveform possesses a nonlinear "attractor" with a dimension between 4 and 10. Continued refinement of the ACE algorithm to allow for detection of more nonlinear distortions is expected to further clarify the extent to which the sEMG signal associated with the "somatopsychic" waveform of NSA is differentiated as nonlinear as opposed to random. This case report describes the progress of a 52 year old male with chronic psoriasis, first diagnosed in April of 1992. After the condition exacerbated over a five year period, he was placed on 12.5 mg/week methotrexate, and oral immunosuppressant medication in October of 1997.After commencing the medication, the condition reduced from 6% body coverage, with flares of 15-20%, to a body coverage of 5%. Following a cessation of the oral medication in February, 1998, the condition recurred at the previous uncontrolled level within one month. The patient was again placed on 12.5 mg/week methotrexate, and subsequently the condition reduced to 5% body coverage. The patient’s dose was reduced to 10 mg/week, and later to 7.5 mg/week, with the psoriasis remaining at 5% coverage. On 5/18/98, the patient commenced regular NSA care. He reported a reduction in the psoriasis condition on 6/3/98, and was taken off the oral medication on 6/25/98. The reduction continued, and the patient was advised by his medical physician on 7/01/98 to continue the cessation of oral medication. As of 9/30/98 the psoriasis had decreased to 0.5% to 1.0 % of coverage, and prior plans to initiate ultraviolet-A therapy were canceled. As of 11/98, a five month period since cessation of methotrexate, the patient has remained under regular NSA care, with no recurrence of psoriasis body coverage greater than 1%, the only medication being a topical ointment. This is contrasted to the recurrence after one month, following the patient’s first cessation of methotrexate, and prior to NSA care. The possible role of NSA care in the reduction of the patient’s psoriasis, and other health benefits is discussed. A preliminary study was conducted to evaluate changes in digital skin temperature (DST), surface electromyography (sEMG), and electrodermal activity (EDA) in a group of twenty subjects receiving Network Spinal Analysis (NSA) care. Data, simultaneously derived from all three parameters, were considered to be indirect correlates of sympathetic nervous system activity. Subjects, including a group of five controls, were assessed for a period of 17 minutes. The continuous assessment period included a baseline interval of 4.5 minutes, followed by a 12.5 minute period which was divided into five 2.5 minute intervals. Care was administered to the NSA recipient group immediately after the baseline period, whereas controls received no intervention following baseline. Results revealed no significant differences in DST either within or between the two groups. Surface EMG readings were relatively constant over the five intervals following baseline in the NSA group, while controls showed significant (p < 0.05) increases in sEMG at the second through fifth intervals relative to the first interval following baseline activity. Electrodermal activity was significantly decreased (p < 0.01) in the NSA group in the second through fifth intervals compared to baseline. Moreover, decreases varied between intervals, but exhibited a leveling from the third through fifth interval. Control subjects, alternatively, exhibited an increase in EDA in all intervals following baseline. The extent of increase resulted in EDA activity significantly greater than the NSA group at the third through fifth intervals. It was concluded that the increase in EMG activity in the control groups may have reflected an increasing level of anxiety due to the duration of the recording period. Since the NSA group expressed constancy in sEMG activity during the same period, coupled to significant decreases in EDA, a "sympathetic quieting effect" was postulated to occur in subjects receiving NSA care. This conclusion is consistent with hypothesized neurological pathways linked to responses observed during NSA care, as well as other reports of selfreported improvements in mental/emotional state and stress reduction in patients receiving Network Chiropractic Care. About the Cover: Functional Magnetic resonance Imaging (fMRI), which measures the relative presence of oxy-hemoglobin, has gained attention as a non-invasive medium through which high resolution images of the brain and other tissue may be acquired. This technology may provide a useful assessment of cortical changes following chiropractic intervention. Images of the patient depicted on the cover, on the left, reflect cortical activity (lighted areas in the parietal cortex, frontal cortex areas 9, 10; visual association areas 19, 37, and 39) associated with the learning process of a "novel" muscular maneuver of the foot. Images on the right reflect cortical activity following a Network Spinal Analysis (form of chiropractic) adjustment session, taken approximately 20 minutes after the first set of images, involving the same activity. The decrease in "lighted" areas before and after the adjustment session suggests that less cortical "planning" or "activity" is associated with the "novel" foot maneuver. Thus, the ability of fMRI to visualize changes in cortical activity may play a significant role in elucidating the consequences of vertebral subluxation correction on neurological function. A self-reported asthma-related impairment study was conducted on 81 children under chiropractic care. The intent of this study was to quantify self-reported changes in impairment experienced by the pediatric asthmatic subjects, before and after a two month period under chiropractic care. Practitioners, representing a general range of six different approaches to vertebral subluxation correction, administered a specifically designed asthma impairment questionnaire at the appropriate intervals. Subjects were categorized into two groups; 1-10 years and 11-17 years. Parents/guardians completed questionnaires for the younger group, while the older subjects self-reported their perceptions of impairment. Significantly lower impairment rating scores (improvement) were reported for 90.1% of subjects 60 days after chiropractic care when compared to the pre-chiropractic scores (p < 0.05) with an effect size of 0.96. As well, there were no significant differences across the age groups based on parent/guardian versus self rated scores. Girls reported higher (less improvement) before and after care compared to boys, although significant decreases in impairment ratings were reported for each gender. This suggested a greater clinical effect for boys which was supported by effect sizes ranging from 1.2 for boys compared to 0.75 for girls. Additionally, 25 of 81 subjects (30.9%) chose to voluntarily decrease their dosage of medication by an average of 66.5% while under chiropractic care. Moreover, information collected from patients revealed that among 24 patients reporting asthma "attacks" in the 30 day period prior to the study, the number of "attacks" decreased significantly by an average of 44.9% (p <.05). Based on the data obtained in this study, it was concluded that chiropractic care, for correction of vertebral subluxation, is a safe nonpharmacologic health care approach which may also be associated with significant decreases in asthma related impairment as well as a decreased incidence of asthmatic "attacks." The findings suggest that chiropractic care should be further investigated relative to providing the most efficacious care management regimen for pediatric asthmatics. characterization of 2818 respondents, representing a 67-71% response rate, revealed a population predominately white, female, well-educated, professional, or white collar workers. A second objective of the study included the development and initial validation of a new health survey instrument. The instrument was specifically designed to assess wellness through patients’ self-rating different health domains and overall quality of life at two "time" points: "presently" and retrospectively, recalling their status before initiating care ("before Network"). Statistical evaluation employing Chronbach’s alpha and theta coefficients derived from principle components factor analyses, indicated a high level of internal reliability in regard to the survey instrument, as well as stable reliability of the retrospective recall method of self-rated perceptions of change as a function of duration of care. Results indicated that patients reported significant, positive perceived change (p < 0.000) in all four domains of health, as well as overall quality of life. Effect sizes for these difference scores were all large (>0.9). Wellness was assessed by summing the scores for the four health domains into a combined wellness scale, and comparing this combined scale "presently" and "before Network." The difference, or "wellness coefficient" spanning a range of -1 to +1, with zero representing no change, showed positive, progressive increases over the duration of care intervals ranging from 1-3 months to over three years. 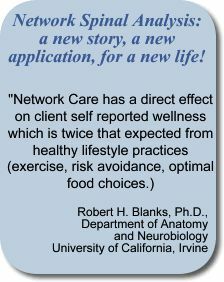 The evidence of improved health in the four domains (physical state, mental/emotional state, stress evaluation, life enjoyment), overall quality of life from a standardized index, and the "wellness coefficient," suggests that Network Care is associated with significant benefits. These benefits are evident from as early as 1-3 months under care, and appear to show continuing clinical improvements in the duration of care intervals studied, with no indication of a maximum clinical benefit. These findings are being further evaluated through longitudinal studies of current populations under care in combination with investigation of the neurophysiological mechanisms underlying its effects. The theoretical basis and clinical application of Network Spinal Analysis (NSA) is described. NSA delivers health care within the subluxation-based chiropractic model and seeks to contribute to the distinction of the various techniques and methods within the profession by describing and discussing its major characteristics. In this regard, clinical observations relative to the application of the Network Protocol have been described in relation to the monitoring of patient and practitioner outcomes. Relevant research from a separate Network Care retrospective study, which impacts on its characterization, profiles the patient population as predominantly female. Other data indicates that Network Care is widely and consistently practiced. Additionally, patients report significant, positive changes in health-related quality of life measures linked to certain clinical components of Network Care. Everybody would like 'Stress Release'. When we have got stress in the body we have stress in the mind. Its called the Mind-Body Connection. The chiropractic technique I use is called Network Spinal Analysis. This technique releases stress patterns in the nervous system. This releases tension in the spine and the body. When the spine and the body can relax the mind can relax. This is called The Relaxation Response. This is where the gold is. When the mind/body is relaxed we can express our true potential. ...physically. ...mentally. ...psychologically.....in our work.....in our relationships and our quality of life, performance and wellbeing is improved. An easy way to remember this is...'The position, shape, tone and tension in your spine is in relation to the position, shape, tone and tension in your life.